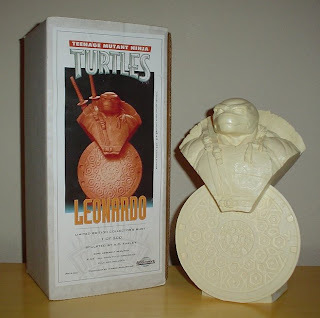 eBay Auctions: Saint Turtle + TMNT Manga! 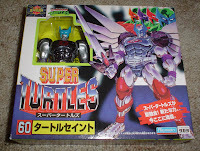 I currently have some exciting Japanese TMNT items up for auction on eBay. 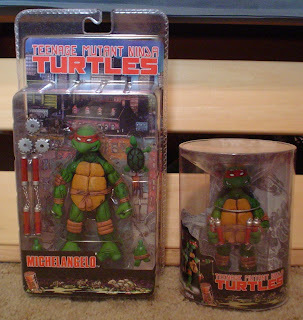 To the left you can see Saint Turtle, a Japanese-market exclusive TMNT action figure. It's about as awesome as action figures get. Also available are five different volumes of the TMNT manga that adapts episodes of the original cartoon series. You can view all of my eBay auctions here. Jenny sent me this video of herself, her friends, and her mom (go mom!) running around Chicago and saving it from evil zombies. Since I was completely amused by it and quite impressed with the amount of effort that they put into it, I'm sharing it with you. Happy Friday! One of my best pals from High School, Erin, emailed this picture to me. "That is awesome and yet equally disturbing!" The more I look at it, the more I think that should be rephrased to, "That is awesomely disturbing!" 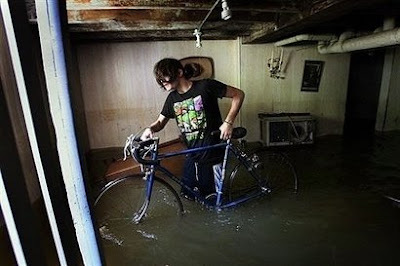 Brandon Stearns helps to remove flood-damaged items from his 83-year-old grandmother's home in Cedar Rapids, Iowa. Iowa's biggest cities were submerged Sunday after swollen rivers forced thousands of residents to flee their homes amid devastating floods in the Midwestern US state. Here's something I never anticipated seeing. Ever. These Fast Forward plush toys strike me as something you would find in an arcade claw game. What I can't help but love about them is the distinctly unique expressions each one is giving, and with a level of anger not typical of Fast Forward. Dario Brizuela to Appear at Comic-Con! Dario Brizuela (probably my favorite of the new artists to hit the TMNT scene in recent years) has just announced on his blog that he will be appearing at San Diego Comic-Con at the IDW Publishing booth. Let's face it, patches aren't just for Girl Scouts and Boy Scouts. Grown-ups like patches, too. It's not uncommon for small groups and organizations to create custom patches. It's also, oddly, not uncommon for licensed characters to appear on these patches. I have some such patches from Boy Scouts and fire houses that feature Turtles, but this one for NASA is my favorite. 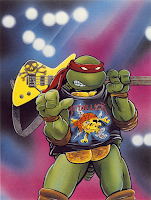 It's also the only such patch I've seen that's used art from an official TMNT artist. Anything based on A.C. Farley's work is über-appealing to me! The modules are named for significant engineers in Italian history, Rafaello, Leonardo and Donatello. This is the logo for the 3 Italian named modules developed by MPLM team members. 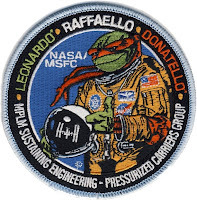 The logo, copyrighted by Mirage Studios, depicts a ninja turtle in an astronaut flight suit. They got in touch with Mirage and asked if we would do the patch. I got to do it because I am in love with the space program. They made enameled metal pins, embroidered patches and jackets and other stuff I never even seen. 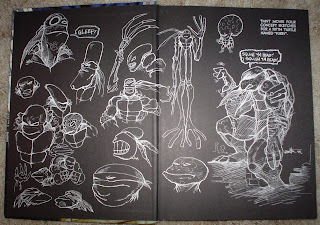 Back when I posted about The Other Fourth Movie, someone requested to see the Kirby concept sketches from Kevin's Artobiography. Well, I just stumbled upon a snapshot of the sketches I took awhile ago, so here you are! Eric Talbot has arted in his sketchbook yet again and shared the results on his blog. Lots of neat little details to check out on this one! Check out the date on this one - Very old school! Today, Newsarama has an interview with The Man himself, Dan Berger. 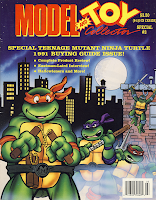 Dan talks about what's on the horizon for the Tales of the TMNT title and a few other things. Admittedly, there isn't a whole lot of, if any, new info here, but it's always good to hear from Dan! Tomorrow, Newsarama will have an interview with Steve Murphy. This is a general post to acknowledge the existence of "TMNT: Back to the Sewer", the new season of the 4Kids cartoon that will begin airing this Fall. Character style art has been drifting out through the fake "blog" on 4kids.tv for about the last month or so. 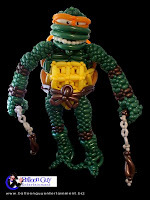 And there was the big "reveal" of the logo on the same "blog," at The Fifth Turtle, and on ninjaturtles.com. I've purposely avoided reporting all of this because I haven't forgotten the pledge I made back in February. I don't think there's much to report beyond the release of the character style art that you can see on the above Web sites. Oh, there was the theme song contest a couple months ago. If anyone missed out on that I could probably post the MP3s. I'm going to continue to not acknowledge this series, although I'm sure I'll make a mention of it right before the premiere and I'll let you know what I think after the premiere. Oops, I think I've slacked on posting comic releases lately. So in case you weren't aware, Tales of the TMNT #46, "Temps" by Dan Berger and Jim Lawson, was released to comic shops last week. This story is set in the middle of the Volume 1 arc "City at War" and is one of the stronger issues of Tales we've seen lately. If you haven't yet sporked your local comic shop into carrying the title, you can get it direct from Mirage at ninjaturtles.com. 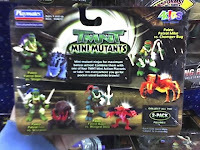 I found the second series of the Mini-Mutants figures in Target tonight. 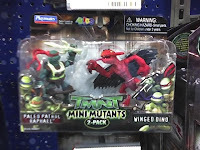 This series is based on the old 2K3 Paleo Patrol figures. Each Turtle comes decked in dinosaur garb and comes paired with its own dino creature... thing. 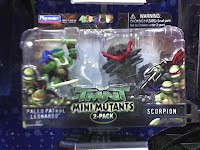 Pics of the three Turtles that were on the peg (Mike, Leo, Raph) are below. Don can be seen on the back of the card to the left. 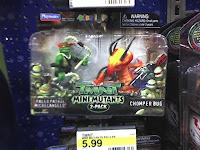 I personally can't find anything worth spending money on in this series, so I happily left them all on the peg as I continue my boycott of crappy TMNT products (about 99% of what is available right now). Although I suppose these are still a billion times better than "Music Don." Did you know there is a DC character known as Turtle Man, apparently an enemy of The Flash? Well, I can't say I know much of anything about The Flash, so this is brand new news to me. In a complete bit of randomness tonight, I was digging through my comic boxes looking for stuff I could remove to make space for my new acquisitions. I found a book titled "Who's Who DC: A Definitive Directory of the DC Universe," which is pretty much what it sounds like. I put it in my discard pile (I'm pretty sure I got it as a give-away in a Con bag back at one of the old Minnesota comic shows), but before moving it to my eBay corner, where I'd throw it into a box as my own freebie, I took a closer look at the cover. This volume of the DC index included a "Turtle Man." So I opened it up to take a look and, amazingly, was met with a familiar style of art. 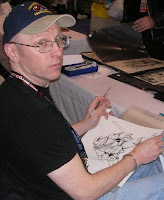 Yes, this Turtle Man is penciled by none other than Peter Laird. Go figure! And since I collect non-TMNT work by TMNT creators and artists, this book is saved from its forever fate of unwanted give-away item. Back into the box (this time with a bag and board)!